The food web is one of the oldest and most central organising concepts in ecology and for decades, food chain length has been hypothesised to be controlled by productivity, disturbance, and/or ecosystem size; each of which may be mediated by the functional trophic role of the top predator. 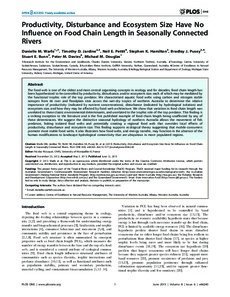 We characterised aquatic food webs using carbon and nitrogen stable isotopes from 66 river and floodplain sites across the wet-dry tropics of northern Australia to determine the relative importance of productivity (indicated by nutrient concentrations), disturbance (indicated by hydrological isolation) and ecosystem size, and how they may be affected by food web architecture. We show that variation in food chain length was unrelated to these classic environmental determinants, and unrelated to the trophic role of the top predator. This finding is a striking exception to the literature and is the first published example of food chain length being unaffected by any of these determinants. We suggest the distinctive seasonal hydrology of northern Australia allows the movement of fish predators, linking isolated food webs and potentially creating a regional food web that overrides local effects of productivity, disturbance and ecosystem size. This finding supports ecological theory suggesting that mobile consumers promote more stable food webs. It also illustrates how food webs, and energy transfer, may function in the absence of the human modifications to landscape hydrological connectivity that are ubiquitous in more populated regions.